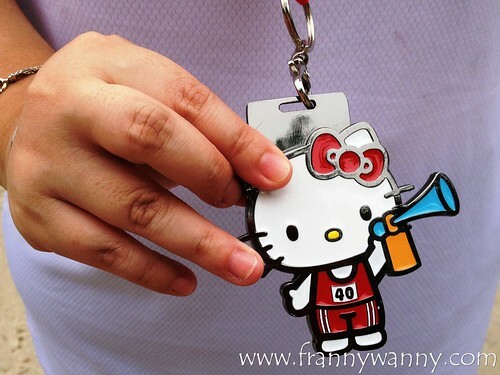 Hello Kitty Run Singapore 2014 - - What can we learn from this? Months ago, I chanced upon another Facebook post (I swear, I must be the target audience of these fitness ads!) 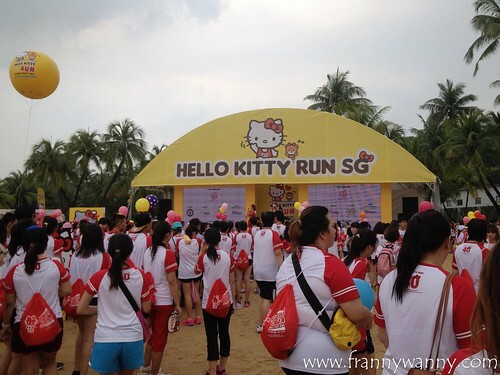 about the first-ever Hello Kitty Fun Run here in Singapore. 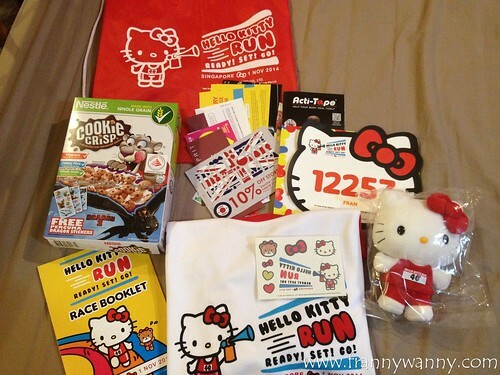 This was to celebrate Hello Kitty's 40th Birthday and being a big Kitty fan that I am, I quickly filled up the sign up form even with no specific details on when the run will be and where it will be held. Yes, I was THAT big a fan. Days after that, a more detailed website announcement was put up where it led us to do our final confirmation and to really sign up for the race. 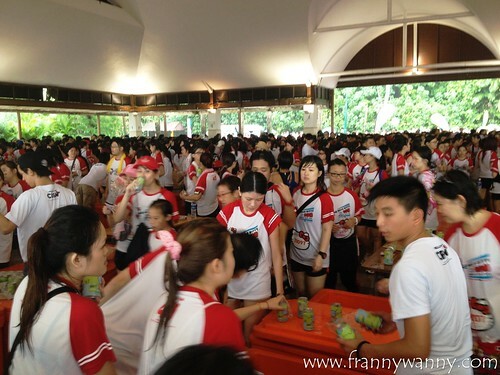 It was a 5K fun run in Sentosa on the 1st of November. With no marathon experience whatsoever in the past, I just took a deep breath and hit that submit button to confirm my participation and quickly paid the S$65 participation fee too. 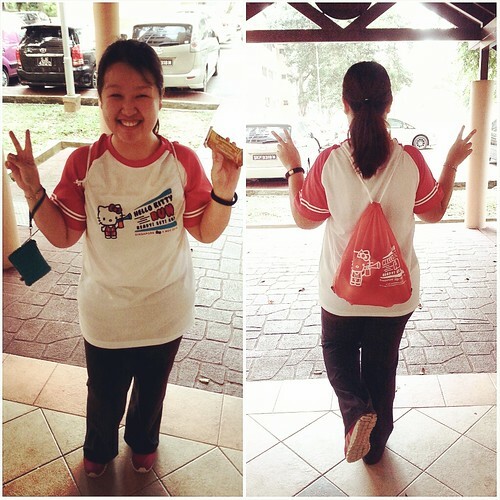 Fast forward to last Friday, they started handing out the cutest race kits that I've ever seen! Paul was the one who went to claim for me and he said that he was impressed at how organized the distribution process was. Must also be because he went at a non-peak hour so he was in and out of Suntec City in less than an hour. Look at my packed race kits! This really got me so excited for the run. The plush toy was sooooo adorable, don't you think? So yesterday was finally the big race day and I was up at exactly 6:30 in the morning! It was a good thing that I was able to pack my light race bag the night before so I was out of the door in no time. Well, I thought I was early! 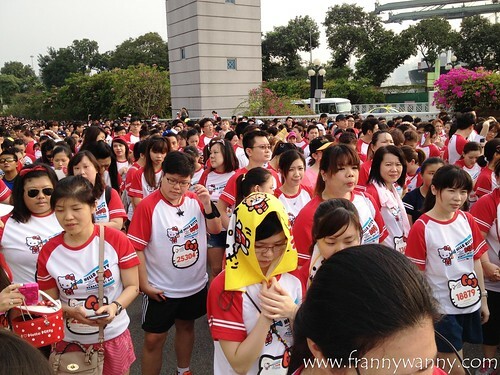 Not until I got off right at Sentosa Gateway and I came face to face with a sea of participants all wearing the same red and white Hello Kitty shirts! Let all Hello Kitty fans unite! At exactly 8am, the 1st flag off was done however since I found out that there were 17,000 participants present so we had to go in by batches for safety reasons. I was part of the 3rd wave which got in at 820am. 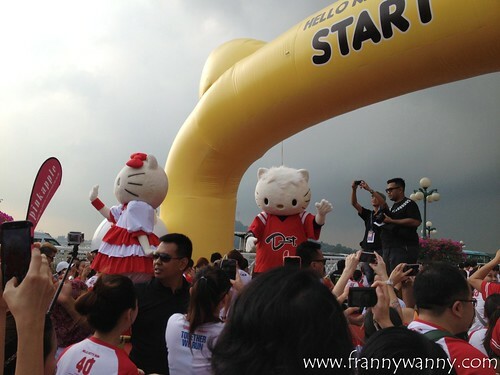 I felt so giddy when I spotted Hello Kitty and Dear Daniel waving at us at the starting point! Of course, I was so star-strucked that I totally ignored the dark, gray sky looming above us. Yikes! 5 minutes into the run and it started to drizzle. Later, heavy rain began to pour and I had to seek shelter together with the other runners for a while. Feeling restless 5 minutes after and I have a feeling the rain won't stop anytime soon, I decided to just go for it. I've never played in the rain when I was a kid so I told myself... "there's always a first time." 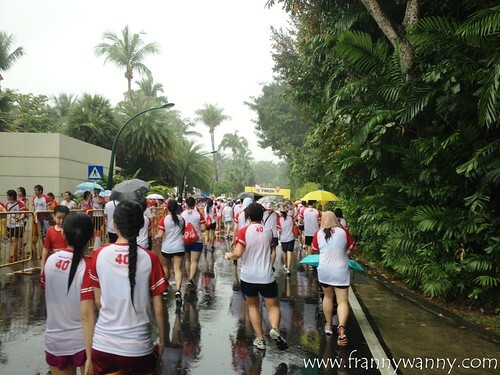 So together with the other runners, I ran/brisked walked under the rain. I was literally so drenched but I didn't care. I was in such a happy mood that not even the weather could ruin it. Well, I was partly hoping though that I remembered to pack in my umbrella but that's fine. So I went past Tanjong Beach, a couple of resorts in Sentosa, Palawan Beach and finally I spotted Siloso Beach. Along the way, I saw markers telling us how far we've gone already and there were water stations too. Despite the strong rain, the organizers still managed to man the water booth and to cheer us on. After an hour, I finally reached the finished line! Well, it wasn't as dramatic as I thought it would be as I literally got stuck in a jam. Human traffic jam. This led towards the pavilion where supposedly the medals and snacks were being handed out. I got into the longest queue ever for the snacks and had to ask around before I spotted the mob surrounded the medals booth. I tell you, it's the first time I came across something so chaotic here in Singapore where everything is normally so organized and proper queues were always formed. People were pushing and reaching out for those precious Finisher's Medals and what I found was a bit off was to hear some guy organizer screaming his head off to tell people to back off. Woah, mister! This was a family fun run so there were a lot of kids present too as well as some elderly runners too. I just think everyone were so eager to show off their medals but to have this guy screaming so rudely was pretty much uncalled for. Well, they could have invested on better signages and maybe a PA system to direct people better? So as I finally got to the front of the queue, the organizers suddenly had this "bright" idea of moving the distribution to the beach area. There goes all the effort of queuing up. People began running to the beach area and again for another round of screaming, pushing, grabbing. I finally saw my friend C so at least we were a bit chill to wait in line which doesn't seem like it will move anytime soon. Haha! We sang with the band playing in the background and shared race stories. This time, a girl organizer interrupted the band's performance to scream that participants have to queue properly or else she won't hand them our medals. Does she really have to threaten people? Having handled quite a number of events in the past, I know how stress can really eat you up but you see, as organizers, it's your duty to keep your participants happy. They showed their support and I'd say that with 17k runners present, this was indeed a very successful run. Plus, they paid to participate so with 17,000 runners + an average of S$70 participation fee, that's quite a large sum of money. Perhaps a lot went to royalties then to rent out the Sentosa Island but I think signages, sound system, more manpower/marshalls and a disposable rain gear wouldn't really cause a big dent on the event budget. Finally got my Finisher's Medal! I'm not really one who complains a lot. In fact, after all that chaos, C and I just thought of heading to the food stall to grab something to eat first. Okay fine, so half of the menu items were sold out already but we just happily made do with the Chicken Hotdog with Cheese Sauce (S$8) that we got. After that, we took some selfies and photos before heading to the exit area where the medals are finally being given away. We went home exhausted, drenched but nonetheless Hello Kitty-happy! 1) Create a better tracking system when people register for the run, claim medals, snacks, pass certain marks during the run. Perhaps a barcode on our impressive waterproof bib which you can easily scan? If high technology means incurring more costs, then how about marking or having several punchers to signify if something has been claimed. 2) Again, do invest on more signages. The pavilion was literally bare and not everyone are blessed with height for them to see what's happening around. Simple signages hanged from the ceiling to show where are the snack booths, medals collection and proper walking directions so people won't be walking around aimlessly would do the trick. 3) Always have a back up plans for sudden change in weather. I agree that it's wrong to blame the organizers for the heavy rain. They're not God after all but hey, if you started handing out ponchos or disposable hats or raincoats to runners, you'll surely be getting more praises than complains today. 4) I also found it silly and pretty much useless to make run announcements on Facebook during the run. It's not like we have the time to check our Facebook while running/walking right? Invest on better radio system, communication plans internally to inform everyone in your team on the latest and definite plan. 5) Have shuttle services ready right at the finish line. C and I had to walk back to the Beach Station and seeing the long queue we decided to continue walking up until Resorts World Sentosa / Universal Studio area. Remember, you have young kids and elderly who were part of the race too. 6) Lastly, and I feel more importantly. Watch the attitude. I really value good customer service and I personally believe that this is the one and only thing that can make or break an experience. No matter how hard it rained, no matter how long people ended up queuing, if there were no rude screaming and instead there was a more compassionate, proper way of communicating the updates, I don't think participants would be taking their angst and complains to social media. Don't get me wrong, I would still join next year's run and I do hope things would be better next time too. I feel that the organizers just lack the experience and expertise to handle such a large event. As they always say... better luck next time! Woah... that is kind of weird. An event in SG not being properly organized. Thankfully, most of the runs I have joined in Manila is organized and marshals along with signs are present all over. No pushing and definitely no double takes on getting medals.